½-hour lessons are held at the studio once per week after 2:30 P.M. on Monday, Tuesday, Wednesday or Thursday. 1-hour lessons are also available every other Saturday morning. The lesson charge is for four ½ hour lessons per month. The first lesson is complimentary. Over 30 years experience in acoustic and electric guitar, including teaching, band, individual, and theory experience. 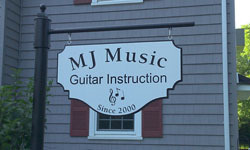 Various styles of guitar instruction including: Standards, Contemporary, Rock, Jazz and Classical. A current member of Partners in Education. A current member of the American Federation of Musicians Union. We will provide quality instruction that meets or exceeds the student's expectations or the lesson is on us.